As a chemical element, Germanium (Ge) is denoted by the numerical value of 32 on the periodic table and is a shiny grey-white metalloid. Historically, it has been utilized as a semiconductor, and should not be confused with the flowering plant Germanium. In 1885, a new mineral was discovered in a mine near Saxony and was dubbed argyrodite, alluding to its modest silver composition. This mineral was subsequently analyzed by a prolific chemist by the name of Clemens Winkler, who proved that it was indeed comprised of silver, amongst sulfur and one new element. He isolated this element one year later, and in typical fashion as with most eminent scientists of his day, conferred himself the privilege of naming said element. 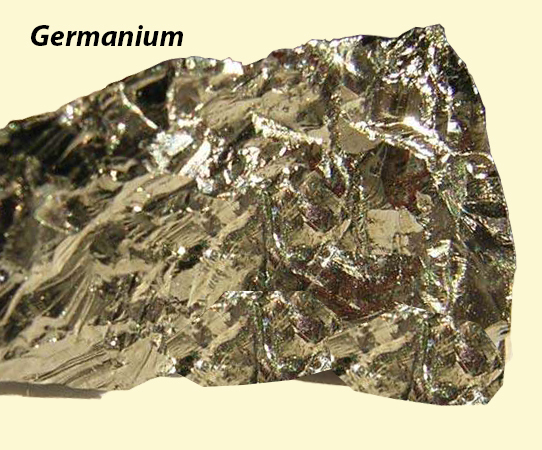 He dubbed this element Germanium in honor of his heritage and homeland. It was not till the 1930s that the intrinsic value of germanium was realized. This coincided with the development of electronics, which required efficient semiconductors. Semiconductors are somewhere in the middle of the spectrum of conductors and insulators. The conduction potential of a semiconductor is subjectable to change by an external force such as an electric field. 30 years later, the germanium transistor was developed. This paved the way for myriad applications for solid-state electronics. Today, germanium is typically used for fibre optic technology, night-vision capabilities and as catalysts for polymerization. In fact, the global demand for Germanium is steadily increasing. China, the world’s largest economy is rapidly installing fibre optic lines of communication throughout the region, hence driving up this demand. Germanium has had various health applications in recent times. It has been used categorically for diseases affecting the cardiovascular system, high blood pressure (hypertension), high cholesterol (hyperlipidemia), ischemic heart disease, conditions affecting the eyes and vision such as cataracts and glaucoma, as well as hepatic conditions such as liver cirrhosis and viral hepatitis. Germanium has also been used for ailments afflicting the musculoskeletal system such as osteoarthritis, rheumatoid arthritis, and osteoporosis. Subjective symptoms have also been reported by users of Germanium to have been alleviated – depression, low energy, and fatigue have reportedly improved by some users who have incorporated Germanium into their supplementation regime. While it may seem surprising to some given that Germanium is a metalloid, it has also been reported to benefit those with heavy metal toxicity (mercury, cadmium etc.). Germanium has also been employed as a scavenger of reactive oxidative species (free radicals) on account of its inherent antioxidant properties. Of relevance especially in the 21st century, is the claim that Germanium has anti-carcinogenic properties. Proponents of Germanium have stated that it can reinforce the body’s immune system by catalyzing its production of interferon-α. Interferon-α is an endogenous cytokine which has anti-cancer properties. Another postulation made by supporters of Germanium is that it facilitates the body’s production of natural killer cells. These are part of the body’s innate immune system and are a subset of white blood cells which seek and destroy foreign pathogens, including cells which have gone rogue and turned cancerous. The Asai Germanium Research Institute (AGRI) was founded in 1969 after Dr. Kazuhiko Asai from Japan began his quest to investigate the effect of germanium on the biology of humans. He had been inspired by anecdotal evidence compiled from Russia, which taken together suggested that Germanium had viable and untapped potential as a therapeutic agent. Dr. Asai’s claim to fame was that he had discovered methods to produce Germanium that was chemically indistinguishable from that found naturally in plants. He had also found that Germanium was found in many naturally occurring plants and herbs such as garlic, ginseng, and aloe vera. Germanium has been consistently found in herbs and plants which have been employed in the use of Traditional Chinese Medicine for centuries. These include Shelf Fungus, Wisteria, Ginseng, Comfrey, and Gromwell. Of these, shelf fungus has one of the highest concentrations of Germanium found naturally. It was mentioned in the autobiographical book “Cancer Ward”, written by Aleksandr Solzhenitsyn, who won a Nobel Prize in 1970. He mentions the use of “chaga”, the Russian term for Shelf Mushrooms as a folk-medicine used for the treatment of cancer. Some of the modern day applications of Germanium insofar as cancer is concerned to include gastric cancer, pancreatic cancer, and leukemia. Research has not definitively elucidated the anti-cancer mechanisms of Germanium, but several theories have been circulating. Of those, the most probable one lies with Dr. Otto Warburg’s hypothesis. As a Nobel Prize winner for Biochemistry, he suggested that Germanium may retard the growth of cancerous tumors by boosting the delivery of vital oxygen into our cells. This increased oxygen delivery may restore the homeostatic balance between oxygen-depleted cells, and the free radical composition within them. Colloidal Germanium is a nanoparticle and is found is a highly crystallized state. Although Germanium itself lies somewhere in the middle along the spectrum of conductors and insulators, colloidal germanium is highly conductive. Colloidal Germanium has been consumed orally as a natural supplement for its anti-bacterial and anti-cancer properties. At GoldenGevity, we have always held a deep respect and a sense of admiration for natural health therapies. Nature holds the key to healthy living, and we have been blessed to have been raised upon her. After researching the myriad benefits of Germanium, and poring over countless anecdotes expanding enchantment about the life-changing abilities of this curious yet often overlooked metalloid, we took it upon ourselves to go further than anyone else has before. While most companies aim to go big with "Large Surface Areas", we turned that concept on its head and decided to go micro. GoldenGevity is the first ever company worldwide to have produced Atomic Particle Colloidal Germanium. An atomic particle is even smaller than a nanoparticle. When we say small, we mean really small! For example, our Atomic Germanium is approximately hundreds of thousands of times smaller than Nanoparticle Colloidal germanium. This has 2 implications on the body. First, it means that there is optimal bioavailability. The smaller the particle, the more likely it may seamlessly permeate through our tiniest blood vessels (capillaries and arterioles) and into the tiniest pathogens (especially viruses). Because of the atomic size, our Germanium particles may able to infiltrate pathogens not only at the cellular level but at the subcellular level as well. Secondly, it also implies that our product is the safest in the market. This is because, the smaller the particle, the less likely it is to be entrapped by our main metabolizer (the liver), as well as our main purgers (the kidneys). This is relevant, especially when other companies peddle metal supplements which have much larger molecular sizes, and therefore may have immense potential to cause toxicity in the form of liver or renal failure. Natural Health enthusiasts can finally consume Germanium in its safest possible form and enjoy all the benefits nature has to offer. Furthermore, as a natural therapy company, we take immense pride in our work. Our processes are completely chemical-free and 100% natural if not organic. We do not partake in dangerous or unethical practices in this novel application of Germanium. There are absolutely no added substances, chemicals or toxins to our pure Atomic Germanium production process.